Today, Lily had the honor of visiting the Crim Primary School in Bridgewater, NJ. It was her first visit there, and we look forward to many more. The Counselor at the school, Miss Giana, first met Lily at the Arbor Glen Senior Living Facility. Lily visits there every week, and Miss Giana was so impressed with Lily that she inquired about Lily potentially visiting her school. Today, the planning for Lily to visit the Crim School came to fruition. Lily first met with the Principal and staff. Then Lily met the volunteer from the school that has been coordinating the program at the school. 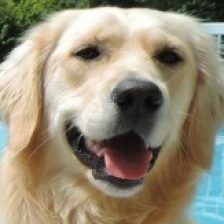 There are currently two other therapy dogs that visit the children, Bella and Erik, but they are always looking for more dogs to visit, and Lily fit the bill. Lily and her handler went to the first classrooms to visit some of the children. The children responded very well to Lily. 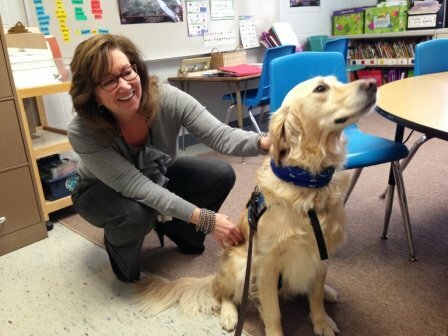 The teacher coaxed a few to pet Lily as they were afraid of Lily at first, but soon, with their teacher’s help, they were petting Lily and even singing to her. Then Lily and her entourage went to another class. Each of the children read to Lily, as well as gave her lots of love and pets. The children told us about their own pets, and they really hit it off with Lily. In keeping with the Paw for Reading theme, the children chose books about dogs. We read about Hollywood Dogs, such as Lassie and Rin Tin Tin, and about the Presidents’ Dogs (Did you know that Abraham Lincoln had a service dog named Fido?). We also learned about a dog’s sense of smell. Did you know that a dog has so many million more scent receptors that a human that they can smell each ingredient in a stew that is cooking on the stove? Wow. That’s amazing. It was time for lunch, and the class went off after giving Lily more hugs and pets before they left. Lily had a wonderful visit, and we can’t wait to visit again. Do you have a Reading to a Dog program in your community? Tell us about it in the comment section, below. We would love to hear from you.